Chinese Checkers is a fun game to play with 2 to 6 players. There are some different ways to play the game. We'll discuss the most popular way called the "hop across" version here. 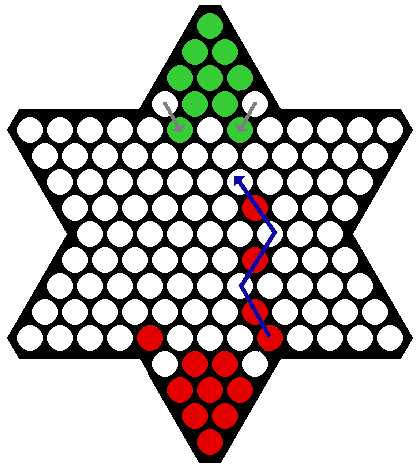 Chinese Checkers uses a special board that looks like a six pointed start. There are lots of places in the star where marbles fit. Each player has 10 colored marbles that start out inside the point of the star. The object of the Chinese checkers is to get all of your marbles to the opposite point of the star. The first player to do this wins. When a player takes a turn, they may move one marble. The marble can be moved to an adjacent open space or may jump over other marbles that are right next to the marble. You can only jump over 1 marble at a time (for example you can't jump over 2 marbles that are next to each other), but you can do multiple jumps on the same turn; as long as the hops are all lined up. See the blue path of hops in the picture below for an example. You can hop over your own or your opponent's marbles. You do not have to hop over a marble if you don't want to. You can move in any direction. 2 players - with two players you move all your marbles across the board to other player's start point. You can also play with multiple sets of marbles where each player plays 2 or 3 sets or colors of marbles and has to move all of them across the board to win. 3 players - 3 players can be played with 1 or 2 sets of marbles. If using 1 set, then the players must move to the opposite empty star point. If using 2 sets, then the players set up their colors on opposite sides and must move their colors to their own opposite side. 4 players - this way is standard Chinese checkers. Two opposite sides are left open. 5 players - this is sometimes not considered a legal option. One player will have an empty space opposite, giving them the advantage. Is often played with the youngest player getting the advantage. 6 players - each player has a separate color of marbles and tries to move them to the opposite corner. The game was not invented in China, but rather in Germany. The game has little to do with normal checkers, but comes from a game called Halma. The name Chinese Checkers was just a marketing play when the game was brought to America. It was originally called Stern-Halma in Germany and then Hop Ching Checkers in the United States.